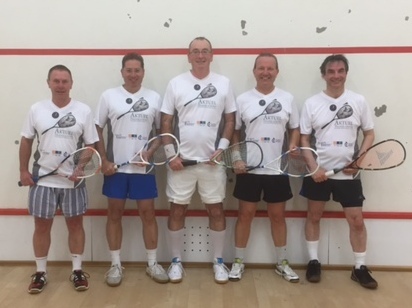 The club fields a number of squash teams in the Oxfordshire League, where we play other clubs on a weekly basis throughout the year. We also field a veterans team (45 and over) in the Berkshire League. These matches are played every two weeks in the Winter. We are always looking to strengthen our teams, so if you haven’t tried team squash before, and fancy combining competitive squash with a great social atmosphere, we want to hear from you! Teams consist of five players, ranked according to ability, who each play their equivalent in the opposing team. Matches typically start at 7.20pm, take about two hours to complete, and are followed by a meal provided by the host club – either on-site or at a nearby pub or restaurant (for home games, it is the Three Horseshoes pub). There is a match fee for each player (£10 away / £15 home). This covers the court fees, the meal and two bar drinks. Support for home matches is more than welcome – you can see 1st or 2nd team matches every Tuesday and 3rd team matches on most Thursdays. Veterans matches are played every other Monday throughout the Winter. See the Links box for a list of all home fixtures.